Located in Lindsay, Ontario, Mariposa is the family owned and operated dairy that produces the artisan, handcrafted Celebrity Goat Cheese line. Mariposa goats are fed a specialized high-energy, high-protein diet of roasted soybeans, which results in exceptional quality milk. Goats convert all carotene in their diet to vitamin A, leaving their milk and cream pure white. Goat’s milk is lower in fat and cholesterol and higher in calcium and Vitamins A and D than cow’s milk, making Celebrity Goat Cheese a great option for a health conscious diet and/or for the lactose intolerant. Acclaimed for its wonderfully creamy texture. Recognized for its distinctively tangy taste, and applauded for its innovative, delightful flavor combinations. Celebrity Goat Cheeses are made from 100% pure Ontario goat’s milk to help make any eating occasion extraordinary. This rich and creamy goat cheese is rolled in crushed garlic and hand-picked herbs for a zesty freshness that can only come from the garden. Whether stuffed in an olive, spread on crackers, or enjoyed alone—this cheese is sure to please. Application: This goat cheese is delicious simply spread on crusty bread and crackers or used in bruschetta, salads, omelets, grilled vegetables, pizza, creamed potato dishes and stuffings (to name just a few of the wide range of cooking applications). 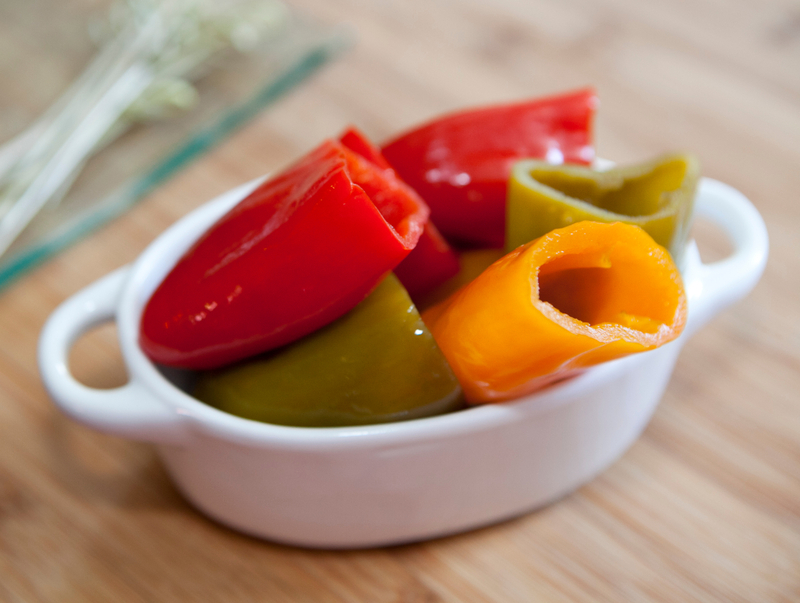 A mixture of Peruvian red, green and yellow cone peppers deseeded and packed in a lightly salted brine. Their brilliant-colored flesh holds a crisp bite and sweet taste that is perfect for stuffing. Application: The perfect size for hors d'oeuvres, stuff with fresh goat cheese for a simple appetizer or jazz it up with mushrooms, quinoa and chicken for a hearty finger food. Pairings: Tricolor Mini Pepper Cones accompanied by the dry, crisp, and clean taste of Gewürztraminer will be sure to please the palate.